Home Create Free publicity announcements Free Social Network Distribution Holidays And Christmas Promotions receive FREE marketing services Save Promoting Your Business Need Help Promoting Your Business or Services During Christmas Holidays? Need Help Promoting Your Business or Services During Christmas Holidays? Here’s a chance to not only promote your own business or service, but you can also be an encouragement to others during the Christmas holiday season! 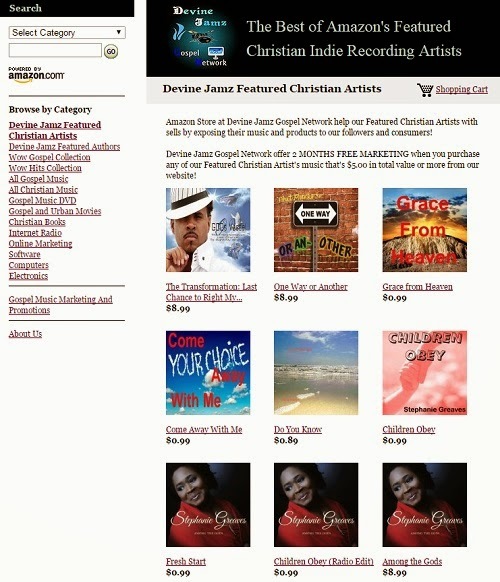 Now until 12/26/14 when you purchase any of Devine Jamz Featured Christian Artist’s music from the Amazon Store at Devine Jamz Gospel Network you will receive FREE marketing services that we take pride in providing. 3 publicity announcements posted on an optimized Content Management System. 3 publicity announcements published on the headline of Gospel Music Entertainment Newspaper. 1 Advertisement blast of your business from our partner's portal and 4 huge marketing networks. Distribution of each announcement through Social Networks where our followers includes working leaders in the industry. This offer is by request only and expires 12/26/14. Purchase of music must be $10.00 or more! Free services apply to Christian ministries, faith base businesses, and online businesses or services that do not promote obscene language; unlawful content; discriminatory content; drugs/alcohol/smoking; and questionable content or images. Please do not auto subcribe our email. It will be considered as spam email!